There's a big change on our best horror games list as [gasp] Resident Evil 2 is removed... because Resident Evil 2 Remake has replaced it (phew). It feels weird to remove one of the most influential horror games of all time but it speaks volumes of the remake that it's able to replace the game it recreates - it's a beautifully made and gorgeous looking retelling of the story that's essential for all horror fans whether they've played the old game or not. Elsewhere we have 10 of the best other horror games of all time for your consideration. From old classics like Resident Evil 2 and 4, or Dead Space, to contemporary modern scares like Rush of Blood's VR terror or SOMA's existential dread. Whatever you're after in terms of terror, there's something here to please/disgust/scare you. Just don't blame us if you don't get any sleep after playing any of these. Jasper Byrne made his name "demaking" Silent Hill into 2D games, and you can feel that series' influence throughout his side scrolling indie debut. Creeping monstrosities scrape down barely-lit corridors, the world seems to shift around you, and you can never quite trust that your surgical-masked protagonist is the good guy. This first-person shooter was heavier on the shootout action than most horror games (the remarkable enemy AI still impresses to this day), while its arsenal of weaponry gets more brutal - wall-pinning, weaponised railway spikes, anyone? - the more you play. But just as you begin to feel powerful, something that can't simply be shot comes along to put you in your place. F.E.A.R. 's best scares came about when you were riding the high after clearing out a room full of tough enemies. Thats exactly the moment when you'd notice a strange figure staring at you from the end of a hallway. You'll come to dread the thought of bumping into the ghastly little girl, Alma, when you least expected it. If creepy, phase-in-directly-in-your-face dead girls aren't enough, Paxton Fettel seals the deal as a telepathic cannibal who leaves behind remnants of his feasts for you to find. Objects start to move on their own, all the lights would turn out one by one. What happens next, well guess you'll have to play it to find out. Some games tread the line between real and not-real beautifully and Condemned: Criminal Origins' murder-solving intro blurred the boundaries beautifully. Starting with with a very Hannibal-like overly staged murder, thing are almost immediately... wrong. There are barely human homeless attackers to fight, black light blood trails to follow, and things just get worse from there. By the time you're exploring a ruined department store full of people wearing the faces of discarded mannequins it's hard to tell where you crossed over from 'cop solving crimes' to 'man potentially in hell'. It's a very physical game, mostly focusing on a block/attack melee combat system, with guns and ammo a rare and treasured respite. It's constantly dark and unpredictable, blurring the line between a monstrous reality and an even worse something else. Picking up on the tropes of Japanese horror and folklore that were made famous in The Ring and Ju-on, the Fatal Frame series has always been unsettling. Characters are frozen in place with fear, their only weapon against soul-stealing ghosts is an ancient camera. This means the only way to fight your enemies is to face them head-on, an increasingly terrifying proposition as the game wears on. The franchise has several great entries, but we choose to single out the second game as the best fit for this list. Crimson Butterfly updates the graphics a bit from the first game, and it's the most inviting in its difficulty, making sure there's an ever-present threat without getting too frustrating. It also has the best story, a personal journey between two sisters dealing with loss and guilt. Its always nice when the intense experience is backed up by a plot thats deeper than 'survive'. There's a fairytale feel to Little Nightmare's strange world, but it's a darkly unpleasant one. And certainly not suitable for kids unless you want to scar them for life. Focusing on a strange little character in a yellow mac, you have to escape The Maw, a never really explained location full of snuffling, twitchy grotesque creatures out to get you. While it has issues - some frustrating perspectives and controls, mainly - the horrible atmosphere and revolting cast still make this a great horror experience. One minute you're trying to sneak past a contorted blind man's impossibly long arms, the next you're running from a tidal wave of flopping obese restaurant gluttons. It's disturbingly beautiful, and framed with all the love and care of an twisted animated movie. Alan Wake isn't like most horror games. It doesn't trade in excessive gore or jump scares - in fact, it's not that scary on the whole. But its sense of place and character is second to none. That place is Bright Falls, a Twin Peaks-inspired mountain community with a terrible secret. The dulcet tones of the night DJ rambling across the airwaves - mixed with the little vignettes you can catch on TV - make this town feel alive, like a character unto itself. Its story unfolds like a thrilling TV miniseries, right down to the episodic structure that bookends each plot twist and revelation. Alan Wake further distinguishes itself by, well, being a lot of fun to play. Maybe that sounds a bit mean, but you'd be hard pressed to find a more enjoyable horror game than Alan Wake from a pure gameplay perspective. Developer, Remedy is as famous for action as storytelling, and that comes to bear here, as simple, fluid controls do away with the stilted awkwardness that's characteristic of this genre. Taking on a group of enemies is challenging for all the right reasons: the encounters are well crafted, and the pistol-plus-flashlight combat combo is fun to use without making you feel invincible. As if being trapped in a monster-infested fortress without knowing who you are or why you're there isn't scary enough in Amnesia: The Dark Descent, you'll have to guide protagonist Daniel to salvation while maintaining his sanity. That means staying out of the darkness (in a huge building where light is scarce) and running from monsters, which have a habit of popping up extremely unexpectedly. You have no weapons; you cannot fight them, and each daunting new room is usually host to some unexplainable, spooky event that drains Daniel's sanity further. Of course, the best way to lose your own sanity is to don a pair of headphones and play Amnesia in the dark - and if you manage to get through the infamous "water part" without losing the run of yourself, know that you've succeeded where countless others have not. Teen slashers have been around for nearly four decades now, but aside from the abysmal Friday the 13th on NES, games haven't really been brave enough to venture into that territory. Until now. Or rather, Until Dawn (zing), a 2015 survival-horror game about a pack of randy teens going on vacation to an isolated mountain cabin, only to find that some heinous entity is set on killing them off. But it's not all fun and games: the characters will die gruesome deaths if you can't navigate Until Dawn's horror movie logic, and it takes every opportunity to scare the bejaysus out of you. While many games on this list are here because of their fear-factor alone, Until Dawn earns a spot for more meta reasons, too - it's wilfully, soulfully entrenched in horror tradition, and uses those tropes brilliantly. It's packed with winks to the slasher genre, and you'll still love the ridiculous twists even if you see them coming from a mile away. You'll laugh as much as you scream, if not more, and few horror games capture that sense of grisly fun so well. From Software's Dark Souls games - of which this is a very obvious descendent - don't play like horror standards. They're action-RPGs, built around stat micromanagement and skilful play. And yet they feel scarier than most games that build themselves around fear - stress, dread and jumps come as frequently as loot and levelling. Bloodborne is the best of the lot, a sprawling, mysterious tale of eldritch horror set in a twisted nightmare vision of Victorian Europe. Travelling down cobblestone streets amidst dark spires, you'll hear hushed conversations behind firmly-locked doors, wondering who you are, and what "The Hunt" you seem to be on could be. It's gaming's best Lovecraftian horror - you'll be driven to discover its secrets as much as you are to master its vicious combat systems. This is the series that invented modern survival horror, but that wasn't good enough for director Shinji Mikami. So in Resident Evil 4 he invented the modern third-person shooting, just for fun. Leon Kennedy's adventures in gunplay are rightly famous, the feedback-heavy combat making every situation a shaky joy. But, I hear you cry, how does that make it qualify as a top 10 horror game? Surely it's just an action experience in Resi clothing? Tell that to anyone coming to the Ganado-infested village for the first time. The sheer stress of being rushed by the parasite-infested local population, headed up by a sack-masked, chainsaw-wielding maniac ranks up there with gaming's most frightening moments. Its a feeling that returns constantly - whether it's one of the iconic boss fights, a battle across crumbling rooftops or in the most expected location, Resi 4's horror is in how it puts you on the backfoot and asks you to fight your way out. If Resident Evil is the king of survival action-horror, then Dead Space aimed to be the pretender to the throne, bringing together Capcom's early dread and latter day over-the-shoulder shooting into one gory package. Borrowing from Alien and other sci-fi classics, the 2008 release put players in the role of Isaac Clarke, an engineer trapped on a derelict spacecraft. Soon Isaac finds out the ship isn't as empty as it seems, as a strange alien artefact has transformed everyone on board into hideous, flesh-eating creatures, each more horrific than the last. Dead Space crafts a horrifying experience by limiting the player. Isaac is short on ammo, he rarely knows whats going on in the continually shifting story, and he's most in danger of what he cant see. So much of the disturbing atmosphere is built on what you hear, and the amazing sound design uses audio to fashion an entire deadly world around Isaac. Though the sequel pulled back on the scares somewhat in favour of cinematic action, the original remains trapped in our nightmares. SOMA has problems, largely from clumsy stealth section, but it also has, hands down, one of the most unpleasantly disturbing stories of anything in this list. To explain why would ruin it, but this plays with ideas of consciousness and what makes you 'you' in a terrifying way. When you're not exploring the rusting, decrepit undersea base of PATHOS II, you're playing with some pretty heavy metaphysic concepts fit to give you nightmares. This is a world, filled with broken machines full of glitching human consciousnesses and slimy growths, that expands and grows into something terrible the longer you spend exploring. The undersea and biotech elements make a Bioshock comparison hard to avoid but while their are similarities - man's hubris and science pushed too far, especially - this is far more unpleasant and ethically shocking. The new 'safe mode' means you can also now play it just for the story - finish it and see if you can sleep after. While Until Dawn created a cinematic choose-your-own adventure horror experience, its Rush of Blood spin off focuses on fast action shooting in VR. The 'why' of it all isn't ever really made that clear - there's a roller coaster, it goes through themed levels full of things trying to kill you - but the results are spectacular. While basically an on-rails shooter as you dual wield Move controllers, it has an absolute mastery of the jump scare, using pace and distraction to play you like a fool - 'what was that over there? OH MY GOD IT'S IN MY FACE.' It's a game that could only really work on PSVR, using its claustrophobia and inescapability to push you so far back into the sofa that tipping over is a very real possibility. Outlast offers a first-person trek through a setting literally no one in real life would willingly check out - an old asylum that seems abandoned, but also strangely very active. At night. In the mountains. Miles from help. Who does that?! The set up alone is perfect horror fodder, but this plays out like Found Footage: The Game, via clever use of a videocamera's night vision mode to see in the dark. The grainy, glowing green view it creates gets a little too close to real life as well. It's one part exploring to two parts follow shadowy, wheezing shapes in the black distance through a view finder while cowering behind a table. Scary enough already, the perfection of its pixilated whirring focus pulls only adds to the atmosphere. It's a great game to play with company as well because you'll both be screaming at some point. Silent Hill, as a franchise, is home to some of the most frightening enemies and situations in gaming history, but the series' most abiding horror is Silent Hill 2. This PS2 classic manifests our deepest fears as flesh, to reveal there is no greater evil than our own imagination. 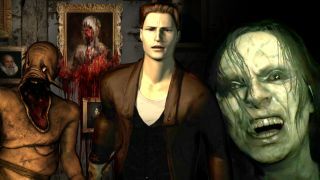 Though he'll encounter creatures like the iconic nurses and Pyramid Head, protagonist James Sunderland is far more threatened by his personal demons. And the empty town of Silent Hill brings them all to the surface. James has returned to Silent Hill answering a letter that seems to come from his dead wife, but all he finds are reminders of his own anguish and guilt over her death. Every corner of the town is inhabited by some new horror, but James has to push past his fears if he ever wants to know whats going on. You and he will not like what he finds beyond them. Silent Hill 2 doesn't just present you with a horror game worth playing, but a story worth being listened to, parsed, and gawping awfully about. The deeper you go, the worse it gets. It seems almost unimaginable that over 20 years after its original PS1 release the classis Resi 2 is back on the best horror lists. But then we are talking about Resident Evil 2 Remake, a from the ground remake of the original game that honors the past while building a future for the franchise with a game nearly two decades old. It's a success, and high on this list, because of how it melds old and new so perfectly. It's a perfect retelling of Leon and Claire's original attempts to escape a zombie filled Raccoon City, with all the monsters, set pieces and story beats you remember. BUT. It's also build with today's horror sensibilities - merging an almost beautiful level of indulgent gore with tight gunplay, clever puzzles and some beautiful levels. This is as essential now as the original game was back in the day. If you brought together the world's most idiosyncratic game auteur and one of its greatest film monster creators and they didn't make one of the oddest, most horrible games yet released, you'd be pretty upset. Hideo Kojima and Guillermo del Toro's "playable teaser" for the now-canned Silent Hills, places you in a single, infinitely looping hallway, and proceeds to find a thousand ways to terrify you. This is no idle boast: one member of the GamesRadar+ team was unable to play this game with the lights off, and was forced to turn the sound down to make it tolerable. There are moments where you face peril, but they're few and far between. The real terror comes from the unknown. What could be around the next bend? A fresh nightmare or nothing at all? Your imagination fills in the blanks, creating more terror than any simple jump scare or creepy noise could. Add in an underlying tale of domestic terror that would make any Silent Hill fan nostalgic, and you've got the world's shortest masterpiece of horror in your shaking hands. You take on the role of Ripley's daughter, Amanda, searching a derelict space station for her mother, only to find the same beast she fought. You're constantly on guard from the cinematic AI of your Alien hunter. This means holding your breath as you narrowly avoid detection, or screaming in terror after failing to reach safety. The atmosphere the game sustains is impressive enough, and it deserves even more credit for taking the Xenomorph, a movie monster bordering on cliche due to overexposure, and making it terrifying once again. Most games can make you jump, they can make scream, but few can make you doubt yourself in real life. Layers of Fear initially appears very familiar as you explore a spooky, creepy and cavernously empty house. The Gothic story unravels slowly as you play an unnamed artist returning home. It soon becomes clear though that madness has overtaken the painter and it expresses itself in the unreliable narration of the physical world. Doors disappear and corridors warp out of shape just in the corner of you; the game rearranges itself in such away to recreate the main character's madness that only a few hours in and you'll find yourself questioning everything. Was that desk on that side of the room last time you looked? Are you sure? Add to that the nature of the protagonist's illness - an obsessional painting made from... less than savoury materials, and you have on of the greatest horror games of all time. It could have been a disaster - a clunky, forced update to a revered series, that left fans clamouring for the bombastic nonsense of Resident Evil 6. But Resi 7 is a triumph, smartly feeding off the best horror movies of the last 20 years, effortlessly easing all that edgy new into a recognisable, modern reinvention of the series. The central story is fantastic, the mysteries artfully concealed and your tormentors, the Bakers, are brilliantly subversive. Switching the action to first-person adds some VR possibilities, but also makes the horror feel uncomfortably close - gruelling, compelling stuff, in a setting you’ll remember long after exploring it up close. But perhaps the cleverest trick is just how Resi it all feels. The safe rooms have the same sense of unsettling respite; ammo feels desperately scarce; and the boss fights have the right mix of terror and glowing, oozing bits to shoot. It’s a tight, smart horror game, and far better than most fans dared hope. It's not the scariest – or most subtle – game on this list, but a brilliant and chilling rebirth.